The 2019 Ridgeline 2WD Sport features include 18-inch gray-painted alloy wheels, Remote engine start, Smart Entry system, Fog lights, Tri-zone automatic climate control with humidity control and air filtration, HomeLink(R) remote system, Body-colored power side mirrors, Body-colored door handles. GET THE PATTY PECK PROMISE: This Honda Pilot comes with an exclusive Value Package and Lifetime Powertrain Warranty when purchased at Patty Peck Honda. 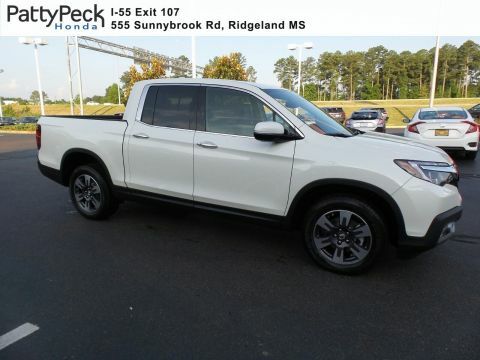 Click, Call 833-653-0116 or stop by Patty Peck Honda for a closer look and more information, we are located just minutes from Jackson I55 Exit 107 in Ridgeland MS.
2019 Honda Ridgeline 2WD RTL extras include One-touch power moonroof with tilt feature, Power sliding rear window, Exclusive 18-inch machine-finished alloy wheels, Driver's seat with 10-way power adjustment, including power lumbar support, Leather-trimmed interior, Heated front seats, Front passenger's seat with 4-way power adjustment, Leather-wrapped steering wheel, Acoustic windshield. 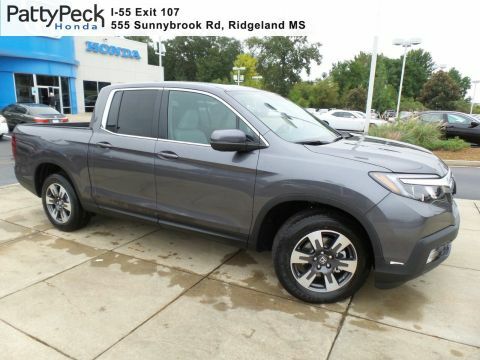 GET THE PATTY PECK PROMISE: This Honda Ridgeline comes with our exclusive Value Package and Lifetime Powertrain Warranty. 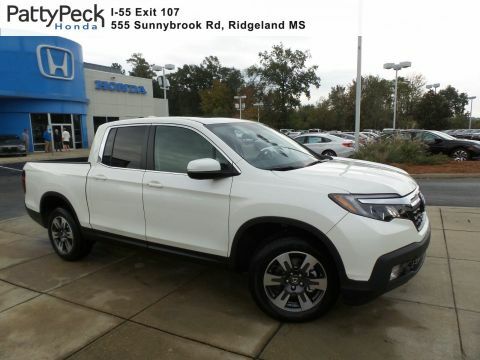 Click, Call 601-957-3400 or stop by Patty Peck Honda today for a closer look and more information. We are located just minutes from Jackson MS, I55 Exit 107 in Ridgeland MS. The 2019 Honda Ridgeline RTL-T 2WD comes standard with extras like Honda Satellite-Linked Navigation System with voice recognition and Honda HD Digital Traffic, Smart Entry system with Walk Away Auto Lock, LED Daytime Running Lights, Multi-angle rearview camera with dynamic guideline, 225-watt audio system with 7 speakers, including subwoofer 8-inch Display Audio system with HondaLink, Apple CarPlay integration, Android Auto integration, USB Smartphone/Audio Interface (1.5-amp in front console), Two 2nd-row USB ports (high-speed charging only), SiriusXM Radio, HD Radio, Pandora compatibility, SMS text message function, Honda LaneWatch, Illuminated driver's and front passenger's vanity mirrors, Automatic-dimming rearview mirror, Exterior temperature indicator, Compass, Intelligent Variable Torque Management (i-VTM4) all-wheel-drive system, Heated body-colored power side mirrors. 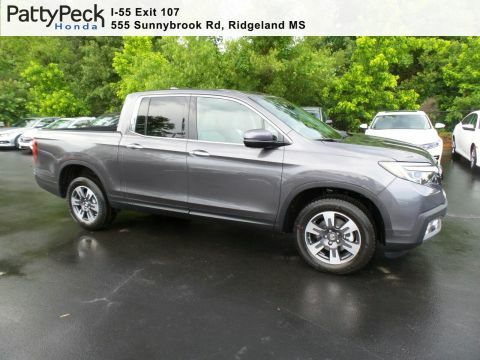 GET THE PATTY PECK PROMISE: This Honda Ridgeline comes with our exclusive Value Package and Lifetime Powertrain Warranty. 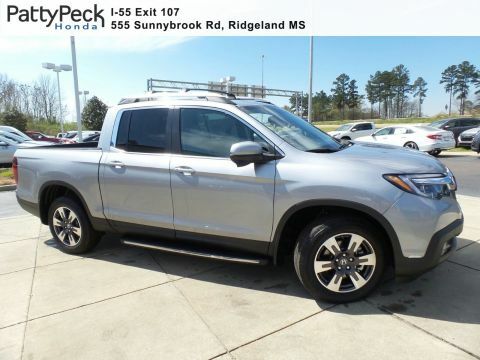 Click, Call 601-957-3400 or stop by Patty Peck Honda today for a closer look and more information. We are located just minutes from Jackson MS, I55 Exit 107 in Ridgeland MS. 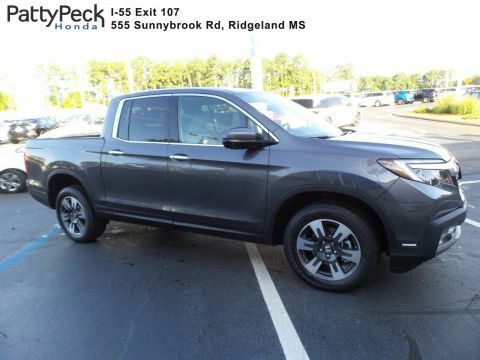 This 2019 Ridgeline AWD RTL-E comes standard with the Honda Sensing Suite that includes: Collision Mitigation Braking System, Forward Collision Warning, Lane Departure Warning, Road Departure Mitigation System, Adaptive Cruise Control and Lane Keeping Assist System. Other standard features include auto high-beam headlights, Blind spot information system (BSI) with cross traffic monitor, LED headlights with auto-on/off (low- beam), Body-colored parking sensors (front/rear), 150-watt/400-watt truck-bed power outlet, 540-watt premium audio system with 8 speakers, including subwoofer, Truck-bed audio system, Heated leather-wrapped steering wheel, Two-position memory for driver's seat and side mirrors, Conversation mirror with sunglasses holder, Blue ambient LED lighting, Chrome door handles. 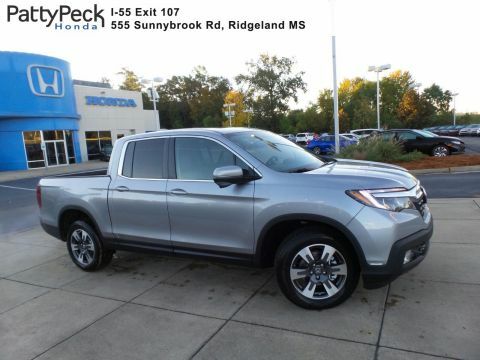 GET THE PATTY PECK PROMISE: This Honda Ridgeline comes with our exclusive Value Package and Lifetime Powertrain Warranty. 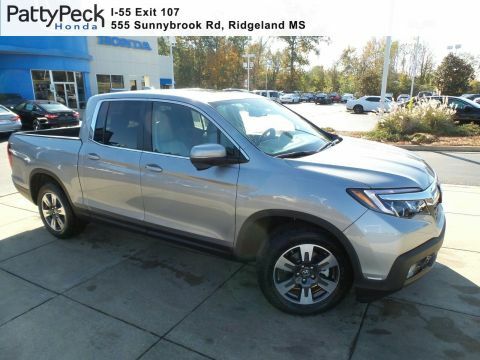 Click, Call 601-957-3400 or stop by Patty Peck Honda today for a closer look and more information. We are located just minutes from Jackson MS, I55 Exit 107 in Ridgeland MS. 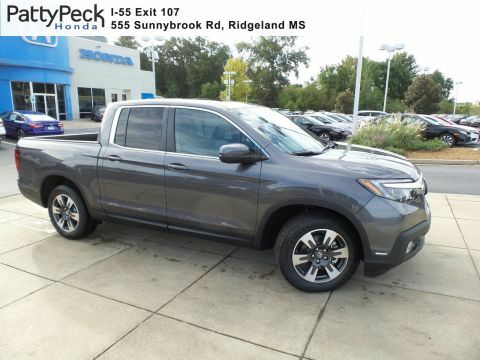 The 2019 Honda Ridgeline RTL-T AWD comes standard with extras like Honda Satellite-Linked Navigation System with voice recognition and Honda HD Digital Traffic, Smart Entry system with Walk Away Auto Lock, LED Daytime Running Lights, Multi-angle rearview camera with dynamic guideline, 225-watt audio system with 7 speakers, including subwoofer 8-inch Display Audio system with HondaLink, Apple CarPlay integration, Android Auto integration, USB Smartphone/Audio Interface (1.5-amp in front console), Two 2nd-row USB ports (high-speed charging only), SiriusXM Radio, HD Radio, Pandora compatibility, SMS text message function, Honda LaneWatch, Illuminated driver's and front passenger's vanity mirrors, Automatic-dimming rearview mirror, Exterior temperature indicator, Compass, Intelligent Variable Torque Management (i-VTM4) all-wheel-drive system, Heated body-colored power side mirrors, Heavy-duty transmission cooler, Integrated trailer hitch with 7-pin connector. 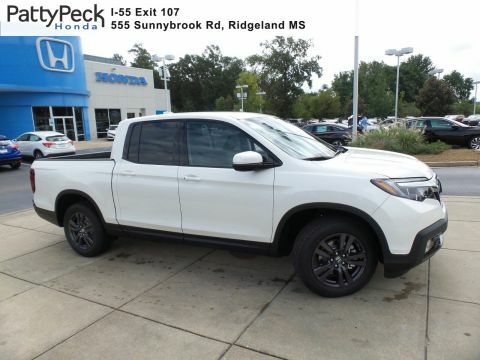 GET THE PATTY PECK PROMISE: This Honda Ridgeline comes with our exclusive Value Package and Lifetime Powertrain Warranty. Click, Call 833-653-0116 or stop by Patty Peck Honda today for a closer look and more information. We are located just minutes from Jackson MS, I55 Exit 107 in Ridgeland MS. 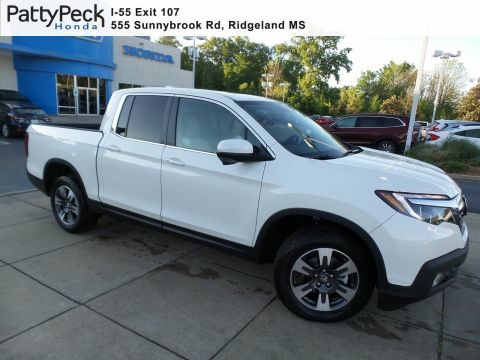 This 2019 Ridgeline AWD RTL-E comes standard with the Honda Sensing Suite that includes: Collision Mitigation Braking System, Forward Collision Warning, Lane Departure Warning, Road Departure Mitigation System, Adaptive Cruise Control and Lane Keeping Assist System. Other standard features include auto high-beam headlights, Blind spot information system (BSI) with cross traffic monitor, LED headlights with auto-on/off (low- beam), Body-colored parking sensors (front/rear), 150-watt/400-watt truck-bed power outlet, 540-watt premium audio system with 8 speakers, including subwoofer, Truck-bed audio system, Heated leather-wrapped steering wheel, Two-position memory for driver's seat and side mirrors, Conversation mirror with sunglasses holder, Blue ambient LED lighting, Chrome door handles. 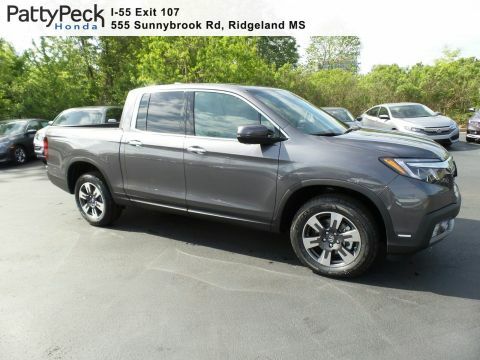 GET THE PATTY PECK PROMISE: This Honda Ridgeline comes with our exclusive Value Package and Lifetime Powertrain Warranty. Click, Call 833-653-0116 or stop by Patty Peck Honda today for a closer look and more information. We are located just minutes from Jackson MS, I55 Exit 107 in Ridgeland MS.
At our Honda dealer serving Ridgeland, Jackson, Madison, Brandon, and Flowood, we offer a wealth of new inventory at unbeatable prices. As you shop for your brand new Honda model, you can buy with confidence knowing you’ll get the best deal possible. The new Honda Ridgeline Truck is ready to tackle anything you throw at it. The Honda Ridgeline offers drivers modern conveniences and innovative technologies to get the job done quickly and easily. The incredible Honda Ridgeline has something to offer you, your work, and your budget. The Honda Ridgeline is always ready and raring to go with incredible capability, an impressive engine, and unparalleled power, so you can get where you’re going no matter the terrain. With the Honda Ridgeline, you’re prepared for anything. The Honda Ridgeline is equipped with an innovative truck bed that allows you to fit everything from tools and equipment to household items or furniture. 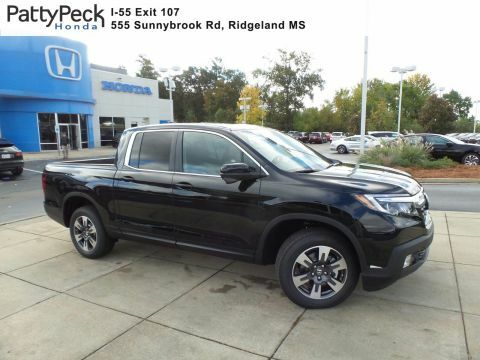 If you think you’re outgrowing your all work and no play truck, check out the Honda Ridgeline finance and lease offers available at our Ridgeland dealership. 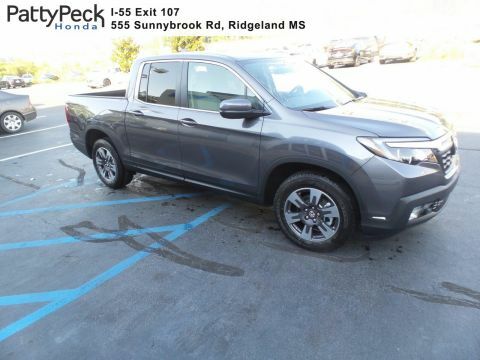 If you’re interested in seeing the Honda Ridgeline for yourself, don’t hesitate to contact us at Patty Peck Honda today to schedule a test drive.